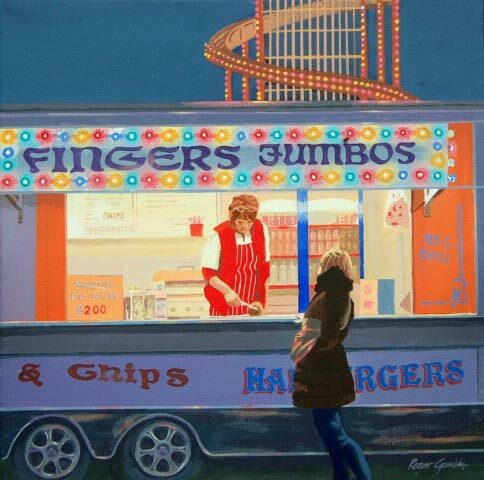 Today, Friday 12 September 2014, Roger Gamble will be the day’s artist in residence at the Artworks exhibition, ready to talk about his vibrant and bold acrylic paintings. He will be in the demonstration area of the Artworks exhibition from 10.15 am to 4.30 pm. Do say hello! Roger Gamble says: I try to reflect my reaction to life in the 21st century Painting is a constant source of discovery and self-discovery. A pristine new canvas on the easel is quite irresistible!. If you can’t make it to Roger Gamble’s demonstration painting day today, do not worry as he will be back again with easel, canvas and acrylic paints on Saturday 27 September 2014. Stay tuned to the Artworks blog for exhibition news and updates, as a different artist will be demonstrating in the Artworks exhibition each day. Or why not follow us on Twitter: @ARTWORKS_tweets. Read more about all the Artworks artists here. 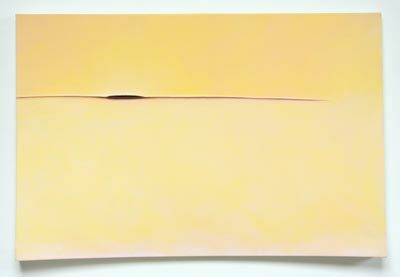 The Artworks exhibition is open daily 10am to 5pm to 28 September 2014. 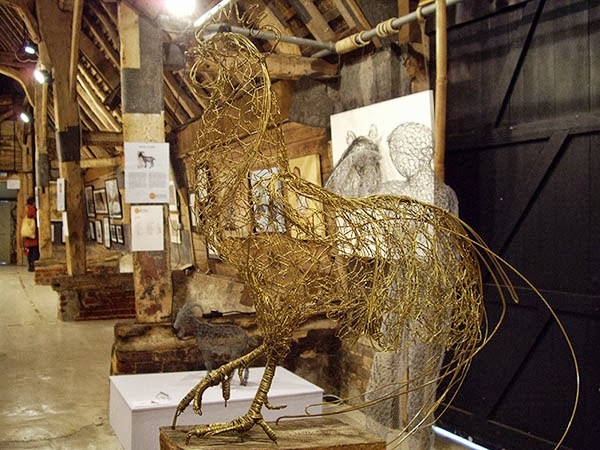 Admission is free, free exhibition catalogue, ample free parking, wheelchair accessible. We also have the Artworks Shop selling small framed and unframed artwork, including original prints, paintings, ceramics and sculpture, together with a wide range of greetings cards and postcards. There is also a café selling light refreshments. This entry was posted in artworks news and tagged demonstrations, landscapes, paintings, roger gamble on September 12, 2014 by admin. 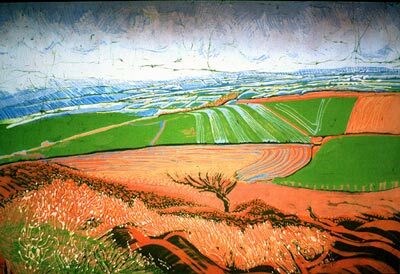 Today, Thursday 11 September 2014, Gillian Crossley-Holland will be at the Artworks exhibition to talk about her expressive and serene landscape paintings, and the oil pastel techniques she uses to create her work. 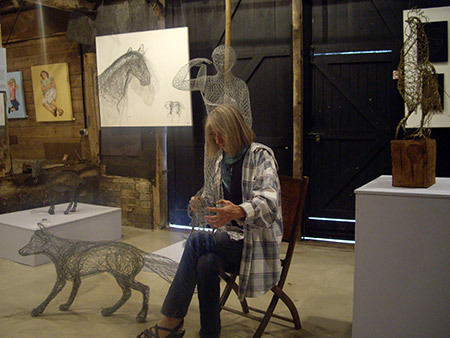 Gillian Crossley-Holland will be in the demonstration area of the Artworks exhibition from 10.15 am to 4.30 pm. 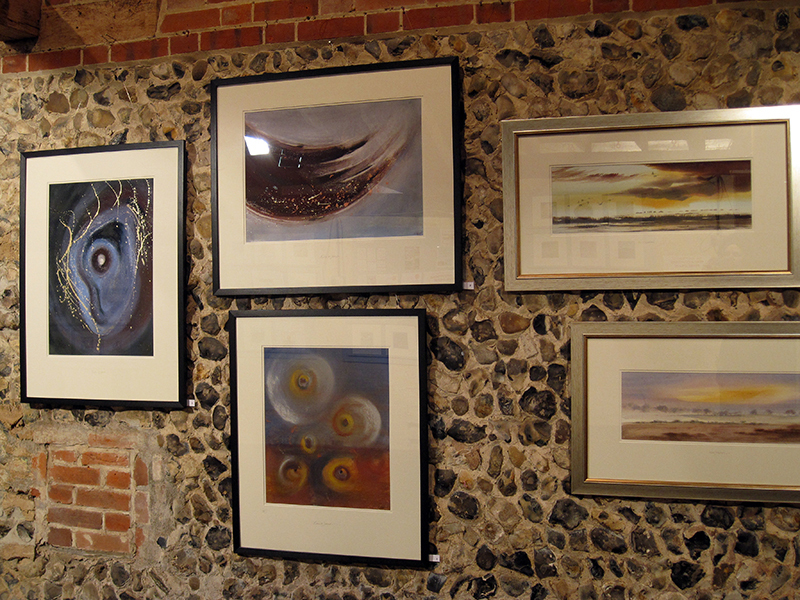 Gillian is a founder member of Artworks and each year also exhibits with Suffolk Open Studios and Norfolk Arts. Gillian Crossley-Holland writes: As an artist, I like the physical edges that form on the surface of my paintings, the unexpected marks that happen between one plane and another. It’s one of the reasons I like working with oil pastels, they are such a versatile medium and allow me to play and make marks instantly. 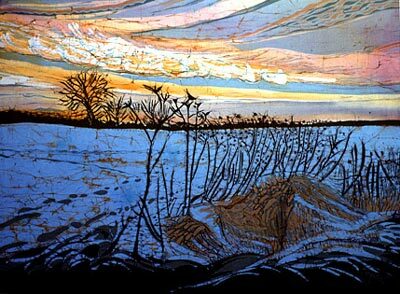 Read more about Gillian Crossley-Holland’s oil pastel paintings. The Artworks exhibition is open daily 10am to 5pm, admission is free, free exhibition catalogue, ample free parking, wheelchair accessible. We hope you will enjoy your visit to Artworks in 2014! This entry was posted in artworks news and tagged demonstrations, gillian crossley-holland, landscapes, paintings, pastels, suffolk on September 11, 2014 by admin. Today, Wednesday 10 September 2014, Ruth McCabe will be at the Artworks exhibition talking and demonstrating watercolours and acrylic painting. 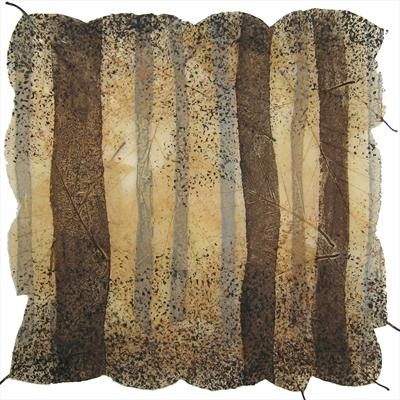 Ruth McCabe will be in the demonstration area of the Artworks exhibition from 10.15 am – 4.30 pm. Ruth McCabe writes: I like to work loosely whether in watercolour or oils, and have worked for the last two years towards abstracting watercolour. Read more about Ruth McCabe‘s work. Stay tuned to the Artworks blog for exhibition news and updates, as a different artist will be demonstrating in the Artworks exhibition each day. Or follow us on Twitter: @ARTWORKS_tweets. This entry was posted in artworks news and tagged demonstrations, landscapes, paintings, ruth mccabe, suffolk, watercolours on September 10, 2014 by admin. 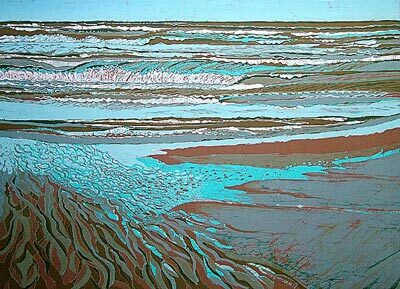 Curwen Print shows how to print Artworks! Sue Jones MA lead tutor will be at the Artworks exhibition on Thursday 25th September 2014 demonstrating drypoint printmaking skills. 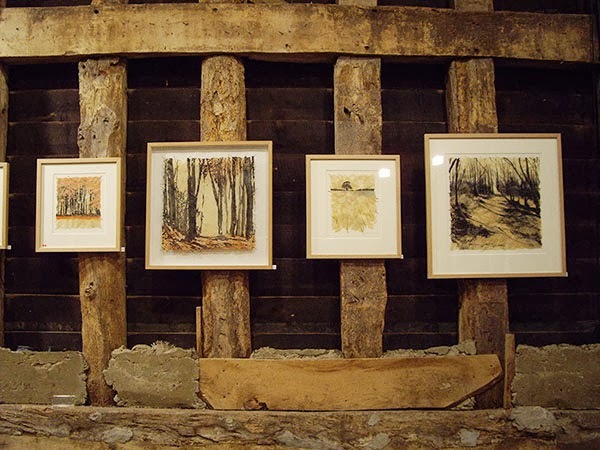 Visitors will be able to share at first hand the versatility and creativity that printmaking delivers, and talk to Sue about all that Curwen Print has to offer. Demonstrations will take place at 11.00am, Midday, 2.00pm and 3.00pm on Thursday 25th September 2014 at the Artworks exhibition. 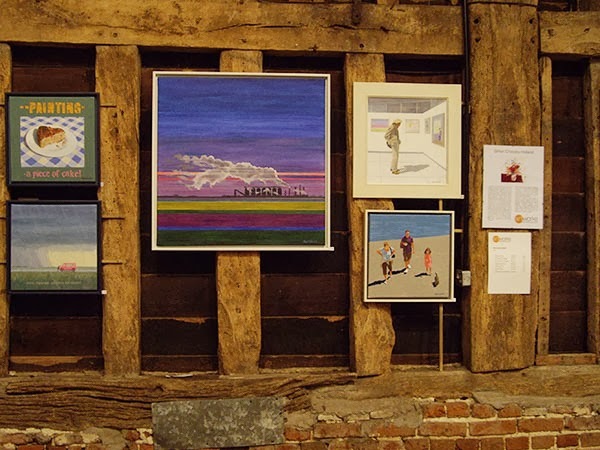 The Artworks exhibition is open daily from 10am to 5pm, from Saturday 6th to Sunday 28th September 2014. The Curwen Print Centre was established as an educational Fine Art Printmaking charity in the late 1990s by Master Printer Stanley Jones MBE and local entrepreneur and art lover Sam Alper OBE. Since its formation the Curwen Print Centre has established a reputation for excellence in its field. The adult course programme offers something for everyone from those who are new to printmaking to those who have previous experience and are looking for Masterclass tuition. School students visit from Cambridgeshire, Essex, Norfolk, Suffolk, Berks, Bucks and Hertfordshire. The majority of schools re-book every year encouraged by the higher grades that they subsequently achieve at GCSE, AVCE, IB, AS and A2. The aim of the study centre is to preserve and develop the essential experience and skills that underpin the concept of the artist’s original print. This entry was posted in artworks news and tagged demonstrations, exhibition, printmaking on September 5, 2014 by admin.